I almost missed the train back to Arizona. “John, what time is your train?,” Normen asked as Joel and I browsed the sales racks at the Gap store in Hollywood. 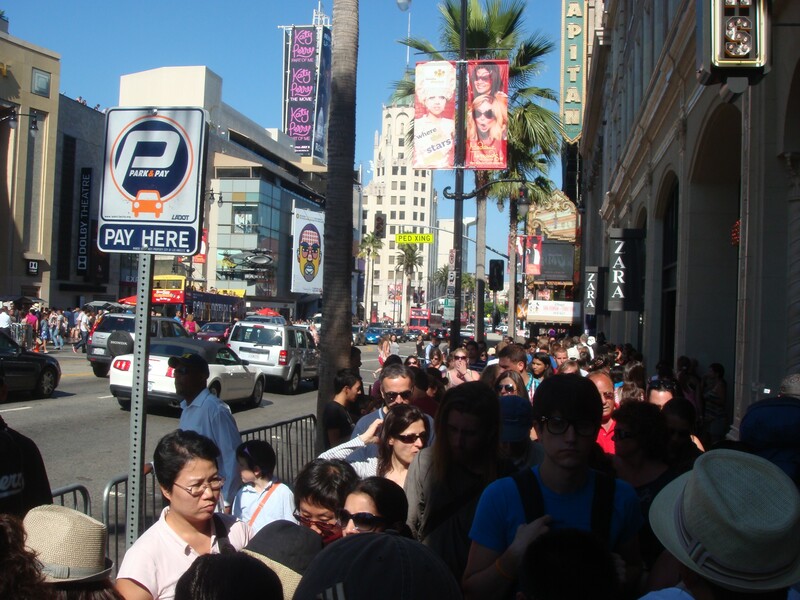 And we did, briskly walking through the heavy crowds of people gathered on the sidewalks outside the Chinese Theater and down Hollywood Boulevard to where we had parked the car. On the windshield, a parking ticket courtesy of the City of Los Angeles greeted us. Union Station wasn’t that far away, but the traffic was thick and it was almost five o’clock. We would never make it, I thought. 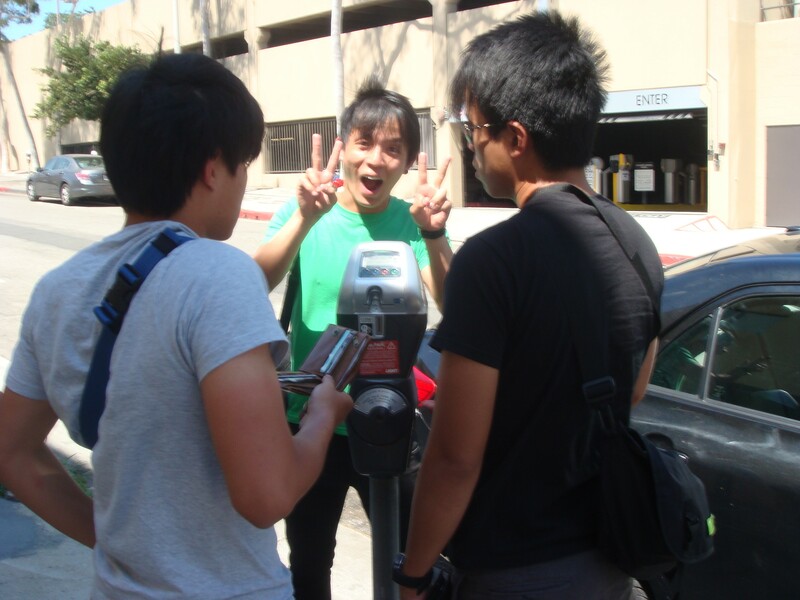 Normen gives the victory sign, as Cheng Yew and Jastine figure out the parking meter. The guys were staying a few extra days in LA before driving up to San Francisco then flying across country to New York before departing back to Singapore. It would be one of those trips they would remember for the rest of their lives. I had made a similar journey to Europe as a teenager and those memories are still very much alive. I was thankful to have been a small part of their American experience. Somehow we made it to Union Station with a few minutes to spare. Jastine and Cheng Yew accompanied me to tracks, where we said our goodbyes and had our hugs. They asked me to visit Singapore one day and promised to show me around. I said I would and thanked them for our friendship — a friendship developed over the course of living and working together for the past 10 weeks in the isolated, desert climate that is Grand Canyon. I would miss them. A lot. Elected in 2010 during the Tea Party wave that swept me and many other Democrats out to sea, Florida Governor Rick Scott made a name for himself as an ideologue, hellbent on fighting the Obama Administration every step of the way. So when the federal government offered funds to the states to construct a high speed rail network, Scott refused the program and the money went elsewhere. “I’m sure it will be,” I replied, adding just a tinge of sardonic wit. Florida was very much on my mind during those last months I spent working at the Canyon. I knew it would be a battleground state in the upcoming Presidential election and polls were showing Mitt Romney, the Republican nominee, to be leading in the Sunshine State. My break from politics had been refreshing and reinvigorating. Nature had truly heeled a lot of old wounds and now I was ready to return to the game. I spent the remainder of my time at Grand Canyon hanging out with my roommate Brian, who was eagerly anticipating the start of the college and pro football season. We traveled down to Flagstaff on one scorching Saturday afternoon to attend Arizona Cardinals training camp. The crowds were enormous that day and it was quite clear the people of the desert southwest were starved for a good NFL team. 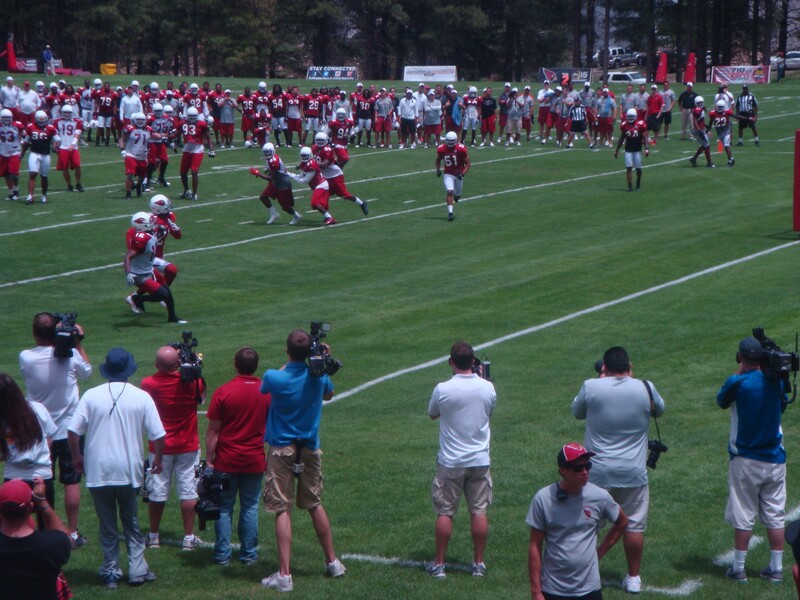 Arizona Cardinals training camp in Flagstaff. When I wasn’t working or hanging out with Brian, I would go to the employee recreation center to lift weights, write, read the New York Times and visit with the international workers. I had gotten fairly close to a few of the Turks. One, a shaggy haired teenager named Ozgur, had become my table tennis buddy. He was quite gifted with the paddle. His English speaking skills were another story. I helped Ozgur with his English and he, in turn, taught me a few key phrases in Turkish. I would learn to say “Merhaba” and “Arkadas” with an Istanbul accent. Ozgur wanted to come to Florida with me after his work was finished. I really didn’t know what to say to this request, afraid he would not be able to understand my world back home. I had not been entirely honest with my co-workers and friends from the Grand Canyon about circumstances involving my being there. But September was on the horizon and I would soon be stepping out of the shadows.